Weight - 133g for 110 mm stem. I wanted an Italian stem for my Colnago C60, but I wanted a moderate rise for comfort. 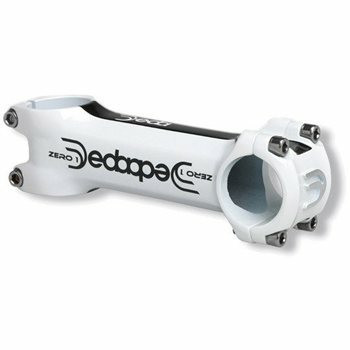 Most Deda stems will have the graphics upside down when in the positive rise position. The Zero 1 stem with it's dual graphics, looks sharp either way you mount it. Even in the positive rise position, it puts enough of the rider's weight over the front wheel to provide excellent control while descending and it's comfortable at the same time. At 133g for 110 mm stem, its very light for this price point. Highly recommended.